Removing wallpaper is one of those home remodeling tasks that doesn't sound difficult until you try it. 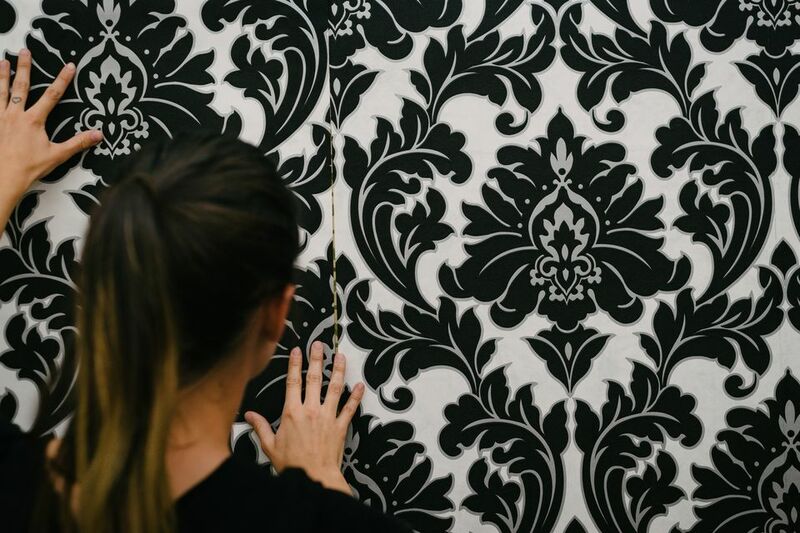 Unless you are blessed with removable wallpaper, you will find yourself fighting a tough battle because you are caught between two opposing forces–wall and wallpaper. Fortunately, there are wallpaper removal tools and techniques that make the battle go a lot easier. Wallpaper is attached to the wall with paste, a wheat-based non-toxic adhesive. As for the wall itself, in most post-war homes, the wall is covered with drywall, a half-inch thick sheet of gypsum that has a paper covering. Drywall's outer paper layer is what makes the task such a delicate one. If you were able to bombard the wall with warm water, the wallpaper would remove easily. Doing so would degrade the drywall's paper layer and create more problems for you. Solvents: Chemical-based wallpaper removers sound dangerous. But most wallpaper solvents today, such as Zinsser DIF Ultra and WP Chomp, are enzyme based, nontoxic and nearly odor free. Solvents are beneficial because they can be used more sparingly than water. Don't think that solvents offer a magic solution, though. You still need to initially perforate the wallpaper with a special tool called a scorer, spray the solvent and then gently peel or scrape the wallpaper away. Plus, costs can add up, particularly when you are stripping paper from multiple rooms. Solvents cost about $10 to $15 per gallon. Water: Direct application of warm water to perforated wallpaper is a popular and highly effective technique. It is the cheapest method, too, since your costs are limited to the purchase of a spray bottle, scorer and stripper/scraper tool. The downside is that spraying water directly on the wallpaper poses the greatest risk of damaging the wall itself because the flow of water is difficult to regulate. Steam: Steam removal of wallpaper combines the best of two worlds: water and heat. Even better, the water is dispensed as an ultra-fine mist. This technique can be highly effective on wallpaper that is difficult to remove. As with the other techniques, you must first perforate the paper with the scorer. One negative is that steam removal entails the purchase of a steamer. Unlike other tools, wallpaper steamers have little use in other home applications once the wallpaper project is finished. Wallpaper Scorer: Whatever technique you use, one theme is common to all–the wallpaper must first be lightly punctured before removal can begin. Do not use a utility knife or razor blade, as proper depth is nearly impossible to maintain. Instead, purchase an inexpensive ($7 to $10) wallpaper scorer, such as the Zinsser PaperTiger or the Piranha Scoring Tool. Wallpaper scorers come in two types: roller or blade. Pricier but recommended, roller models have spiked wheels which puncture the wallpaper with hundreds of tiny holes. Cheaper blade-based models slice lines, not holes, into the wallpaper. Spray Bottle: For both the solvent and water method, you will need a spray bottle as an application device. All solvents initially come in spray bottle form (refill bottles do not). For the water method, no special type of bottle is needed. Any inexpensive, clean spray bottle will suffice. Test it first to make sure that it delivers a fine, consistent mist and does not splatter. Stripper/Scraper Tool: Use a designated wallpaper stripper/scraper tool, not a putty knife or drywall knife, both of which are too blunt for this purpose. Stripper/scrapers have removable razor-blade heads, easy to grip rubber handles, and usually, cost less than $10. Brands include WP Chomp Wallpaper Scraper Tool, Zinsser PaperScraper, Husky Soft Grip and Piranha Scraper with Roller. Steamer: While there is no silver bullet wallpaper removal tool, the one that would come closest is the dedicated wallpaper steamer tool. Electrically powered, this small canister is filled with water and allowed to heat for about 15 minutes. An attachment called a steam plate (8 in. x 11 in., about the size of a hardback book) allows you to force steam against large portions of the wall. Wagner and Earlex each manufacture wallpaper steamers that cost around $50 to $75. General use steamers such as HomeRight's Steam Machine may also be used for removing wallpaper, though its set of included attachments does not contain a steam plate. However, you may purchase a separate HomeRight Wallpaper Steam Plate (10.5 in. by 7.5 in. ).